Excerpt of article originally published under the title "Trump Scraps Cherished "Israel Grievance" Myth." Because Israel is stronger than its Muslim neighbors, the latter have always been presented as frustrated "underdogs" doing whatever they can to achieve "justice." No matter how many rockets were shot into Tel Aviv by Hamas and Hezbollah, and no matter how anti-Israeli bloodlust was articulated in distinctly jihadi terms, that was always presented as ironclad proof that Palestinians under Israel are so oppressed that Muslims have no choice but to resort to terrorism. Yet, as with all false narratives, the survival of this one relied on concealing the bigger, more complete picture, as captured by the following question: If Muslims get a free pass when their violence is directed against those stronger than them, how does one rationalize away their violence when it is directed against those weaker than them—for example, millions of indigenous Christians living in the Muslim world? According to reliable statistics published annually, some 40 of the 50 worst nations in which to be Christian are Muslim majority. Of the absolute worst 21 nations—18 of which are Muslim—"100 percent of Christians experience persecution." 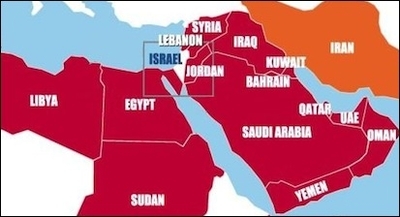 Islamic supremacism is the true source of the Arab-Israeli conflict. The rationalizations used to minimize Muslim violence against Israel simply cannot work here, for now Muslims are the majority—and they are the ones violent and oppressive to their minorities, in ways that make Israeli treatment of Palestinians seem enviable. In other words, Christian persecution is perhaps the most obvious example of a phenomenon the mainstream media wants to ignore out of existence—Islamic supremacism, the true source of the Arab-Israeli conflict. Vastly outnumbered and politically marginalized Christians in the Islamic world simply wish to worship in peace, and yet they are still hounded and attacked; their churches are burned and destroyed; their women and children are kidnapped, raped, and enslaved. These Christians are often identical to their Muslim co-citizens in race, ethnicity, national identity, culture, and language; there is generally no political or property dispute on which the violence can be blamed. The only problem is that they are Christian—they are non-Muslims—the same category Israelis fall under. From here one also understands why what has been described by some authorities as a "genocide" of Christians at the hands of Muslims in Iraq, Syria, Nigeria, Somalia, Pakistan, and Egypt—Muslims who could care less about Israel and Palestinians—is one of the most dramatic but also least known stories of our times. The media simply cannot portray Muslim persecution of Christians—which in essence and form amounts to unprovoked pogroms—as a "land dispute" or a product of "grievance" (if anything, it is the ostracized and persecuted indigenous Christian minorities who should have grievances). And because the media cannot articulate such Islamic attacks on Christians through the "grievance" paradigm that works so well in explaining the Arab-Israeli conflict, their main recourse is not to report on them at all. Apologists whitewash Muslim aggression & present non-Muslim responses as the origins of conflict. Such is the way for all apologists of Islam: to ignore or whitewash Muslim aggression—and then, in that vacuum, distort and present non-Muslim responses as the origins of the conflict. This is especially prevalent in the portrayal of history. Thus, Georgetown University's John Esposito claims that "Five centuries of peaceful coexistence [between Islam and Europe] elapsed before political events and an imperial-papal power play led to [a] centuries-long series of so-called holy wars [the Crusades] that pitted Europe against Islam and left an enduring legacy of misunderstanding and distrust." In reality, these "five centuries of peaceful coexistence" saw Muslims terrorize and conquer more than three-fourths of Christendom; but this inconvenient fact is seldom mentioned, for knowledge of it ruins the "Muslim-grievance" narrative, just as knowledge of modern day Muslim persecution of Christians ruins it. Either way, it is refreshing to see that the sun is breaking through the darkness of deceit that has for too long clouded Middle Eastern realities, including by presenting victims as aggressors and aggressors as victims.